Halloween will not be the same without carved pumpkins. 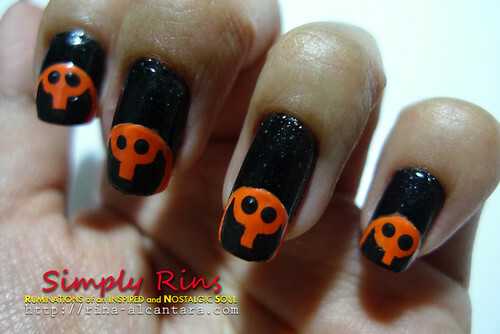 And so, for my 8th Halloween nail art design, I decided to do a Jack-O-Lantern or pumpkin inspired nails. We really don't have an actual big squash here in our country but it has been a consistent Halloween decor. 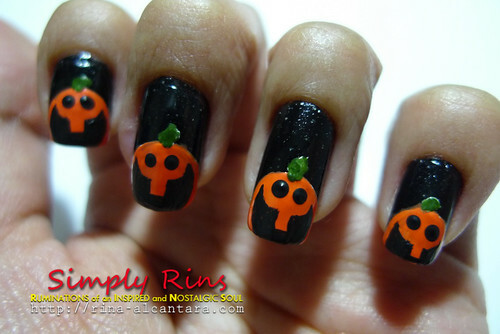 This nail art is yet another black and orange combination. I call this Peeping Pumpkins. If you've been a follower of this blog for quite some time, you would have probably noticed how I enjoy accent nail arts. And most of the time, I use my ring finger as the accent nail. But ever since the Halloween Nail Art Crawling Spiders, I've been in the mood to do freehand nail art wherein I paint the designs on all 10 hand nails! This is 2 coats of Orly Goth. I first thought of using just a plain black color but I really like the subtle shimmer of this shade. Application is really easy and was almost entirely opaque on the first coating. 1. 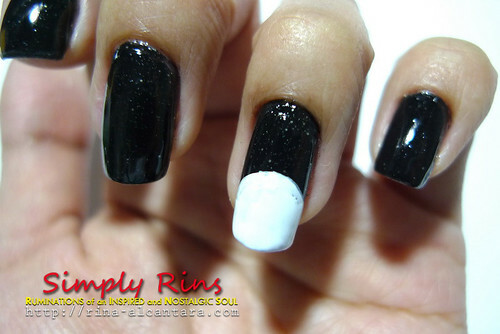 First, I created a white semi-circle from approximately the middle of my nail down to the tips. Based on experience, painting a white base before the actual color is quite effective in revealing the actual shade of your 2nd color. When I painted the orange (for the pumpkin) directly after the black base color, it would take several coatings for the orange to stand out. 2. I allowed the white base to dry completely before I painted the orange polish. This is Dashing Diva Tangy Tangerine Thalia and I must say that I was able to get the bottle color in one coating because of the white base. 3. After everything is dry, I painted the Jack-O-Lantern's face. Usually, the eyes are triangle. But I wanted to keep things simple and just dotted the eyes with black acrylic paint. Oh, I should say that this is my first attempt to use acrylic for nail art. I was always scared it will damage my nails. But I figured the base coat will always keep my nails protected. No regrets since it was much easier working with acrylic paints when doing nail art designs. Anyway, I drew a happy mouth in each pumpkin with one tooth. So they're not just peeping ... they're smiling! Sorry, I can't resist not taking a photo of these 2 chubby pumpkins on my thumbnails. 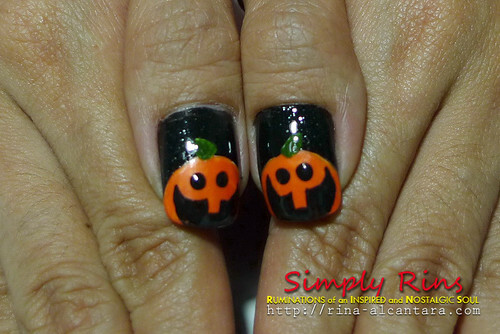 This is probably my 2nd to the last Halloween nail art for 2010. I know I wasn't able to create all those creepy Halloween characters. But there's always next year! I hope you liked this as much as I enjoyed doing it. Halloween is a few days away! What color will your nails be wearing? Thanks so much, Jette Fromm! My pumpkins only have a tooth each! Too many candies from Trick or Treating! Lol! can't wait to see you two being interviewed! its an achievement! great job on those cute pumpkin rins! Great idea to put white under the pumpkins! I wouldn't have thought of that even though I use white under neons. Hi, KarenD! I've been experimenting on how to work with dark base colors and finally, I tried applying a white coat first. So far, it did the trick. I don't have any neon shades. When I finally have one, I'll try to apply a white base first also.